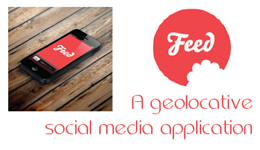 A geolocative social media app that displays posts made within one hundred metres of the user. Once a post is made, it can be 'fed' by other users, which shares the original content from their location and spreads the post through geographical space. Posts degrade and disappear from the news feed after a certain amount of time. Rhythm is a fundamental part of the human experience of place. 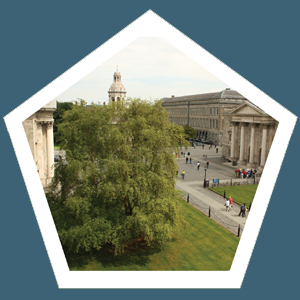 Why not look beyond the imposing Georgian facades, and explore the diverse spacial, visual and audible qualities of Trinity Front Square. In 'Rhythms of Front Square', you are invited to immerse yourself in our 3d environment, during which time you may explore the multi-sensory, multi-faceted approach we have employed to expose its latent rhythms. 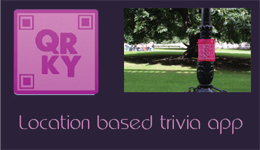 QRKY is the final project of a sub-group of four students from Interactive Digital Media, Trinity College 2013. QRKY is a web-based app and corresponding analytical website which aims to explore the truth and fallacies behind 15 'quirky' myths about the University. The project culminated in the launch of a location based trivia app guided by aesthically pleasing laser-cut QR codes posted in various locations throughout Front Square. Capitalising on the locative nature of QR codes, each laser-cut piece was posted in an area significant to an associated piece of trivia or myth. 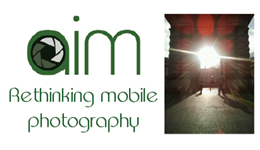 Aim is an app designed to make you rethink mobile photography. Aim works against current trends and brings you back to basics, improving your photographic vision at the time of shooting. Aim invites you to see the Front Square through a new lens as a playground for photography, and guides you towards hotspots where exciting and unexpected photographic opportunities abound. Enrich your technique, heighten your creativity and make your photographs stand out! 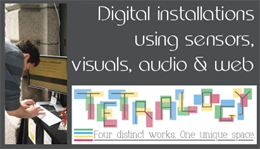 Tetralogy featured a series of four digital media installations that were placed in Trinity Front Square from August 14th-16th 2013. Each installation took a different input from users, with all four creating an overall narrative experience based around the four Greek figures on the Campanile in the Front Square. 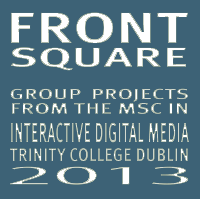 Welcome to the homepage for the five projects from the 2013 graduates of the MSc in Interactive Digital Media. 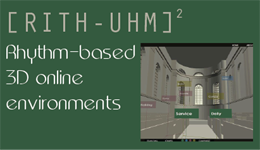 Hover over for a closer look, and click the link to visit the project's homepage.